Welcome to my first article on MTGCasualPlay.com as well as my first article on Tiny Leaders! I look forward to writing articles detailing my local meta game through deck techs or format breakdowns. I am a competitive player at heart, so my articles will have no budget restrictions. It’s a cutthroat world in this region. The largest parts of my Magic personality are Spike and Johnny, so the hope is to feature decks that are not only able to take down a local tournament, but ones which feature synergies and interactions between the cards that are fun to play with. My personal favorite deck is Jeskai Control, but that is for another day. Today’s article forms from the inspiration of spoiler season so let’s dig in! With Magic Origins in the near future, a list with two new spoilers has been on my mind. 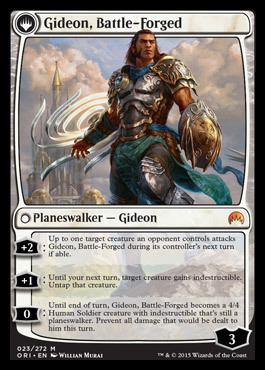 The spoilers that I am talking about are: Kytheon, Hero of Akros // Gideon, Battle-Forged and Liliana, Heretical Healer // Liliana, Defiant Necromancer. Instead of trying to brew up new decks for these cards, I decided to go on and slot them into an already aggressive creature based deck: Abzan Warriors. The addition of creature based Planeswalkers makes any aggressive deck more resilient should we manage to meet the flip conditions. 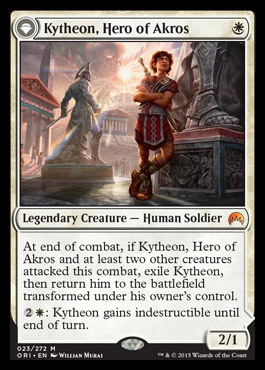 While neither Kytheon nor Liliana are warriors, I feel the value they add more than makes up for slightly less synergy. Before I get into how they add to the deck, or what synergies the deck has, below is the list. This deck can apply pressure from several angles. The warriors in the deck all provide ways to either pressure or disrupt the opponent. examples of this are: [card]Lifebane Zombie[/card], and [card]Mardu Woe-Reaper[/card]. While cards such as [card]Mother of Runes[/card] protect our warriors from removal. [card]Stoneforge Mystic[/card] is a known quantity between fetching swords of various types and [card]Batterskull[/card] in other formats. In this deck, we do have a pair of swords in [card]Sword of Feast and Famine[/card] and [card]Sword of Fire and Ice[/card] to help us gain card advantage while protecting our creatures, but the real stand out target is [card]Obsidian Battle-Axe[/card]. Once Battle-Axe enters play, it will take over the game. Between bouncing it to the newest entry of the battlefield for haste, or just making [card]Skarrgan Pit-Skulk[/card] and [card]Den Protector[/card] harder to block, this card is a must answer threat for our opponent. I’m not running much removal in this deck, but that is because the goal is to not worry about removal game one against a vast portion of the format. While Elves, Marath Zoo, and Red Deck Wins force us to have some removal, the real focus is getting a clock on the table. Going wide for a clock entails us using [card]Sunblade Elf[/card], [card]Mardu Strike Leader[/card], and [card]Blood-Chin Rager[/card]. Staying focused on a few large beaters involves the protection elements listed above. Land the proper sword onto a creature such as [card]Skarrgan Pit-Skulk[/card] will usually make quick work of your opponent. Should you be forced into an attrition match, the deck has several ways to grind out the opponent. The first method that the deck can take is placing +1/+1 counters onto our army. Between [card]Bramblewood Paragon[/card], [card]Lightwalker[/card], and [card]Skarrgan Pit-Skulk[/card] adding counters to our creatures provides more evasion to get in damage. The minor +1/+1 counter theme in the deck allows our creatures to power through any blockers, have a better long game than most mid-range decks, and win racing situations. Leader [card]Anafenza, the Foremost[/card], [card]Varolz, the Scar-Striped[/card] and [card]Gavony Township[/card] are the heavy hitters of this plan. 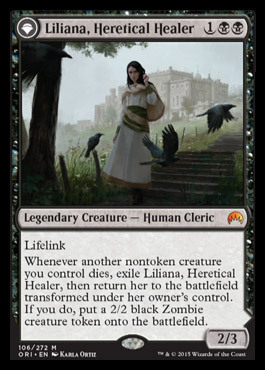 The second method is the graveyard interaction of [card]Bloodsoaked Champion[/card] and [card]Liliana, Defiant Necromancer[/card]. Bringing back threats each turn to add on pressure is a great way to ensure that your opponent exhaust all of their removal. Being in Abzan allows us to have strong answers in the sideboard for any deck we will come up against without hurting our plan of beating down. I have gone for focusing on Red Deck Wins, Miracles and Villainous Wealth Control, Elves (or other tribal such as Fish), and the [card]Back to Nature[/card] is for an Enchantress deck in my meta. I may feature that deck on a later date. I feel that if you are looking for an answer to a deck, try to stick with creatures before resorting to cards that dilute the plan of attacking. Plus you will be able to use [card]Aether Vial[/card] to play your hate cards at instant speed. This is why I went with a card such as [card]Burrenton Forge-Tender[/card] instead of [card]Mark of Asylum[/card]. I look forward to hearing any feedback on this deck going forward. With Origins approaching, I wanted to fit some of the new Planeswalkers into an existing deck that I have been working with instead of starting from scratch to build decks with them as the leader. I feel this deck provides room for customization in your creature selection, as well as sideboard decisions, but yet also provides a home for two of the new Planeswalkers efficiently. Maxing out on creatures helps both Liliana and Gideon flip, giving you more powerful options the longer the game last. I feel that the addition of the new cards helps push this deck forward in my local meta, and I look forward to putting that thought to the test. Solid list, Necromancer. Glad to have some more formats in representation. Welcome aboard! Great first article Necro! I had always thought that when I go to put my competitive Tiny Leader deck together it was going to be Alesha or Shu Yun, but gosh damn it this deck looks fun to play. I love me some beatdown and that Battle-Axe is glorious! Well done… and really looking forward to that enchantress article. That was next on my list to build, so it will be a fun comparison!